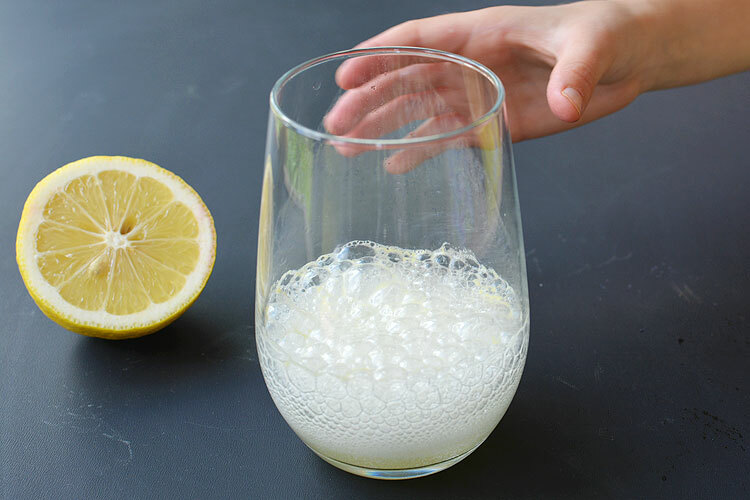 I had no idea you could make the bubbles in fizzing lemonade by yourself! But be prepared, because this recipe falls more into the category of “fun experiments for kids” than it falls into the “delicious recipes” category. You can definitely drink it, but it was more about the chemical reaction and making an edible experiment than it was about making delicious lemonade. It was lots of fun though! 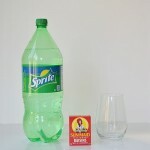 In this experiment, you take an acid (lemon juice) and a base (baking soda), and you mix them together. 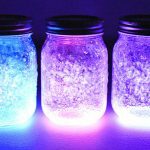 The chemical reaction creates carbon dioxide, which is the same thing that causes bubbles in store bought, carbonated drinks! Pretty cool, don’t you think? 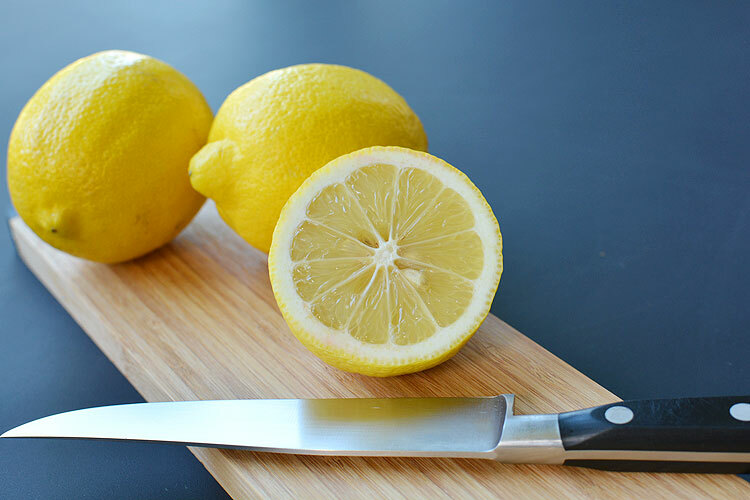 Cut the lemon in half, and pick out the seeds. 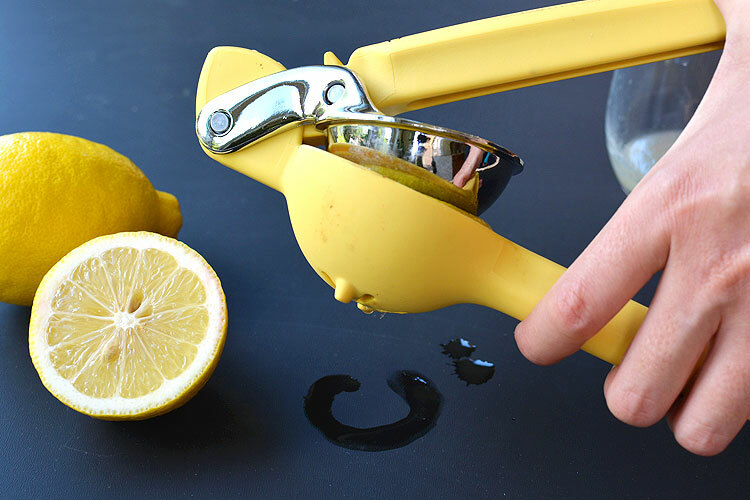 If you don’t have one of these lemon juicers, I HIGHLY recommend getting one! They are amazing! 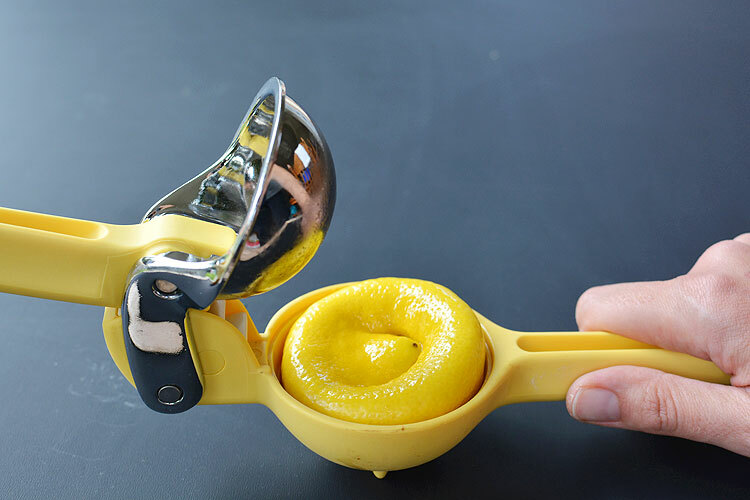 You put the lemon in and squeeze it closed and it squishes out all of the juice. It’s so much easier than the traditional juicer where you have to swivel your wrist back and forth. Add the baking soda to the cup. According to Arm & Hammer, you can safely eat 3.5 tsp of baking soda within 24 hours, but you are supposed to space it out so you aren’t drinking it all at once. Children younger than 5 years old, should have less than that. So definitely make sure you go easy on this stuff and don’t let your kids drink too much. See the recipe below for the safe quantities. It frothed up like crazy! That’s my daughter’s hand… she couldn’t wait to try it and was super disappointed when I said we still had to add the water! 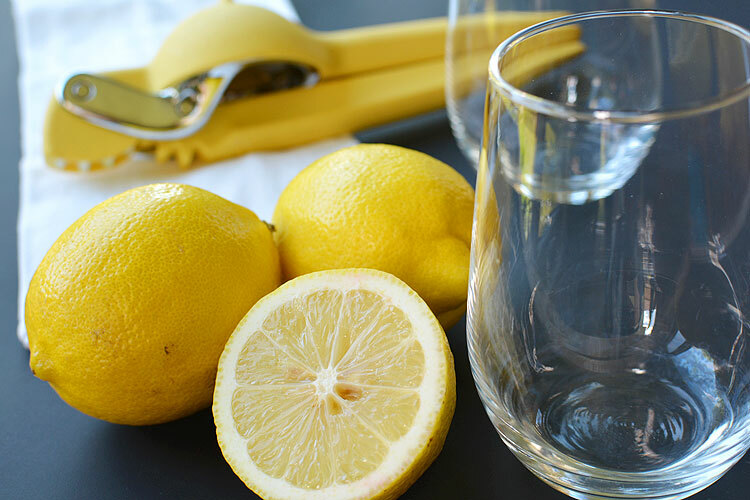 Mix together water and sugar and pour it into the fizzing lemon juice. I would recommend using about 1/2 cup water and 1 Tablespoon of sugar to start and adjust it for your own tastes if needed. I tried adding one cup of water the first time, but it drowned out all of the bubbles. You’ll have to experiment with it as you go. It was pretty cool stuff to watch! But tasty lemonade? Not so much! Baking soda has a really strong taste, so it definitely had a weird flavour! Also, the juice had a bit of a strange feeling in your mouth since the acid and the base had neutralized themselves. When you think of lemonade, you think of an acidic drink, so this was an unusual sensation. You probably aren’t going to drink a whole glass – or at least I wasn’t able to! And my kids didn’t want to finish their glasses either, but they definitely taste tested it to see what we had made together! We made a real glass of lemonade when we were finished (same recipe, but without the baking soda) and they loved it! It’s all about the process and having fun! 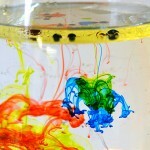 Add the baking soda, ¼ teaspoon at a time so you can watch the reaction twice. Give it a good stir to really get it going! 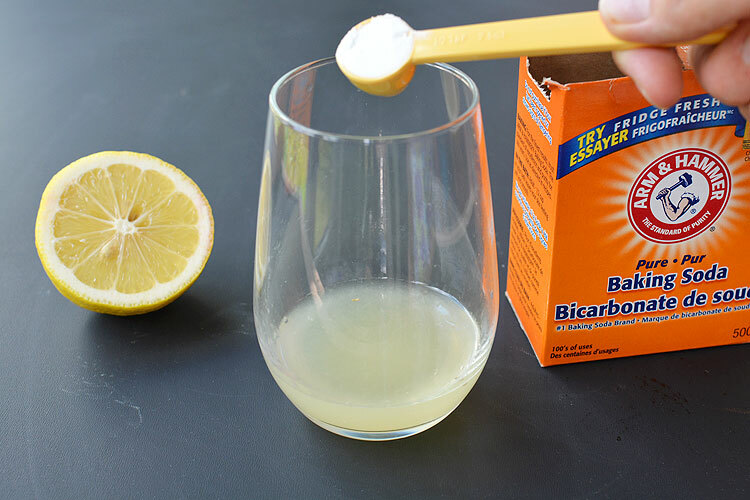 Mix together the water and the sugar in a separate measuring cup, and then add it to the fizzing lemon juice. 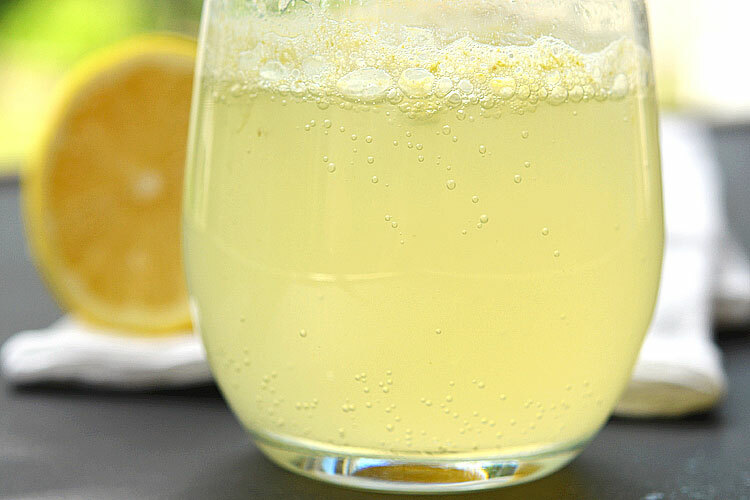 I wouldn't recommend drinking more than a ½ teaspoon of baking soda at one time, so don't drink more than one serving of this lemonade in one sitting. If you are giving it to kids under 5 years old, make sure you split it into two glasses when you are finished, so they aren't drinking more than ¼ teaspoon at one time. It's not the end of the world if they drink the whole ½ teaspoon, I would just try to avoid it if you can. 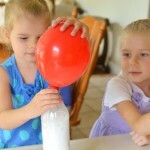 This fizzing lemonade is a great experiment to teach kids about chemical reactions. And I’m not going to lie, I thought it was pretty cool to see the reaction for myself too! I never knew you could create your own carbonated drinks! I won’t be making this all the time, that’s for sure, but the kids had a blast watching the bubbles, and I think I managed to teach them just a little bit of science! My daughter loves lemonade AND science experiments. She will be all over this!! Thank you for sharing with us at Works for Me Wednesday! 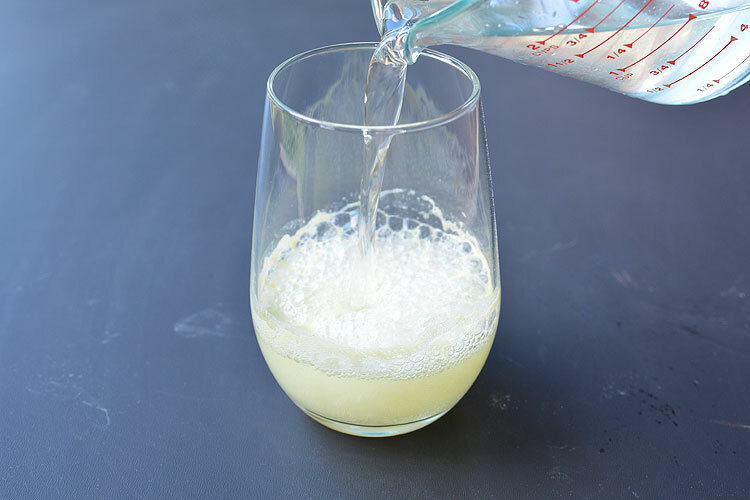 hi,my name is Ronald.i did this by first carbonating the water(adding a pinche of yeast to a mixture of sugar and water and leaving it for the yeast to act on the sugar thereby producing CO2) and then adding the lemon juice…. 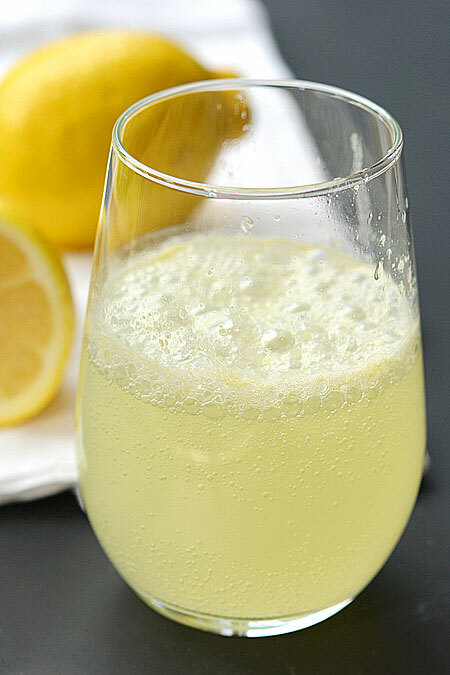 its kinda fun to make and creates a nice fizzy lemonade drink.